This is a lovely matching game with the cute ducks. You need to find two of the same blocks and clear them all in the limit time. There will be time bonus when you clear a couple of blocks. Come on and win the game! 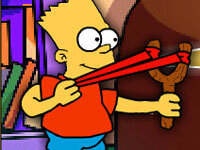 The Simpsons Slingshot Game is an interesting game where you have to destroy the given objects with your slingshot. Drops of fun are falling from the sky in this action-packed game! Defeat wacky-looking monsters and meet cute, friendly companions! Help Goofy proove to the town that hes the best hot dog delivery guy around! 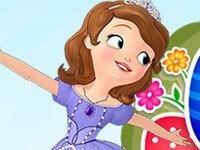 Please help Princess Sofia color the Easter eggs in Easter Day. Enjoy it!